The challenge of understanding and predicting the role of marine biogeochemical cycles in environmental change has led to the creation of a diverse range of plankton system models. Each design aims to capture dominant mechanisms that determine the system response to variability in the physical and chemical environment. Of necessity, the models are semi-empirical, relying on many adjustable parameters to compensate for un-modelled complexity and incomplete ecological knowledge. The development of the MarMOT testbed system was motivated by the need to more fully understand the implications of different model designs and parameter choices and to evaluate plankton models against satellite and in situ data at a process level. i.e. independently of the 3-D circulation models in which they are normally run. MarMOT is designed to support computationally intensive experiments in a multi-site 1-D framework. The idea is to focus computing effort on data-rich locations. Physical drivers (vertical velocities, diffusivities etc.) are supplied as external data. Horizontal flux divergences of the biogeochemical properties can be similarly controlled, allowing 1-D simulations to be run in a realistic 3-D context. Explicit treatment of uncertainty in these drivers and other inputs, including model parameters and initial conditions, is supported by flexible ensemble configuration features. For problems involving large multi-dimensional input spaces, MarMOT ensemble simulations can be used to generate sample output data for building fast statistical emulators of model outputs. Its utility for this has been demonstrated in a University of Durham PhD project (thesis: Oxlade, 2012) opening the way for applying modern Bayesian methods, described in the MUCM Toolkit, to plankton model analyses. Such analyses will be important for improving the representation of ocean biogeochemistry in Earth system models and quantifying biogeochemical uncertainty in their predictions. How well can a simple plankton model (HadOCC) emulate the behaviour of a more complex and more computationally expensive model (MEDUSA) in which phytoplankton and zooplankton are each divided into 2 functional types and the flux of particulate organic carbon (POC) is represented by fast and slow sinking particles? 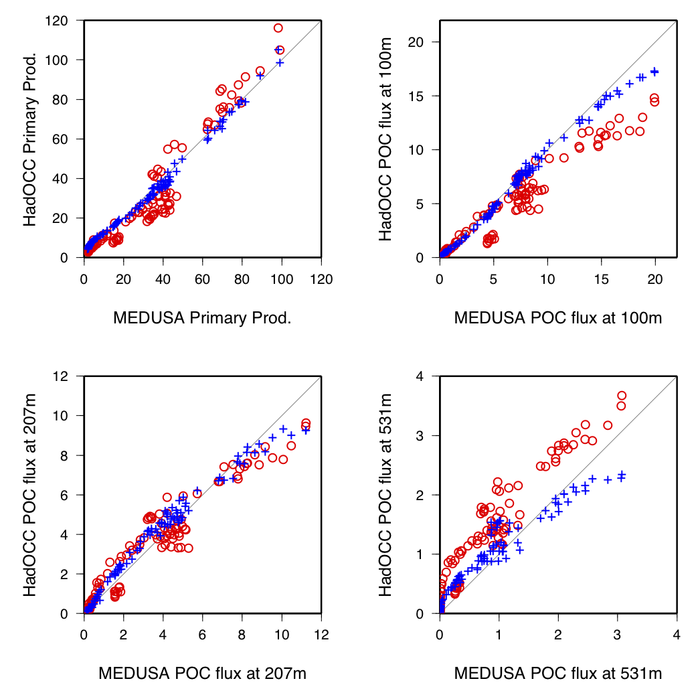 This has been investigated in the i-MarNet project by fitting a version of HadOCC to output from MEDUSA at sites spaning a range of oceanic conditions. Results for primary production and POC flux in mmol C m-2 d-1 (left) show its emulation skill before and after calibration (red circles and blue crosses respectively). To ensure that plankton models reliably represent biogeochemical processes in models of the ocean and of the whole Earth system we need a capability to evaluate the fidelity of their responses to physical drivers. The goal is to constrain the response of the models, via their adjustable parameters, by assmilating Eulerian and Lagrangian biogeochemical time-series data sets combining satellite and in-situ observations. Contemporary physical observations can be used in combination with ocean model output to build statistical models of the uncertain environment to which the models respond. Read more in poster presented at CliMathNet Conference 2013. Download PDF (4.4 MB). The development of MarMOT and its scientific applications at the National Oceanography Centre was supported by the Natural Environment Research Council as part of the Oceans 2025 programme in 2007 and subsequently as an activity of the National Centre for Earth Observation from 2008 to 2013. Its application to Hadley Centre models was a collaboration between NERC and the Met Office as partners in NCOF and JWCRP.